Sales of equipment for producing moonshine have increased sharply. 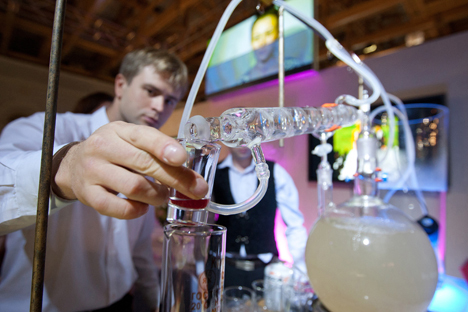 The demand for home distilleries and moonshine stills in Russia has risen. As a result, some citizens are discovering an alternative to increasingly expensive vodka, while protecting themselves from low-quality substitutes. Others are actively joining the ranks of the so-called romantics, preparing their own hard liquors and liqueurs — something that has become not only a hobby, but a source of family pride. Every year, Russians produce at least 66 million gallons of homemade alcohol, as calculated by the Research Center on the Federal and Regional Alcohol Market. While the minimum price of a 16-ounce bottle of vodka in a store is 170 rubles (about $5.25), the net cost of a quart of moonshine is no more than 40 rubles (about $1.25), making its production and sale a profitable business. While making moonshine for sale is against the law, producing it at home for personal use is perfectly legal. Still, moonshine accounts for 20 percent of illegal alcohol in Russia. Equipment manufacturers make life easier for the modern moonshiner. A licence is required only for industrial-level producers; distilling alcohol at home requires only a Certificate of Conformity to the Technical Regulations, which states that all goods produced should adhere to Russian safety regulations. Rossiyskaya Gazeta spoke with over 10 major producers and sellers of moonshine paraphernalia, all of whom have noticed an increase in buyer interest. Sales were up five-fold in the last year, says Yevgeny Demidov, a representative of one of the largest online retailers of equipment for producing moonshine. Their products come primarily from one Russian factory, but they sell some exclusive ones — for example, a brass, handmade, Portuguese apparatus for making calvados and gin. Demidov links rising sales with the increased prices of alcohol in shops. His company sells a complete package for moonshine production at an average price of 15,000 rubles (about $460). Alexei Kozhekin, head dealer at another shop in Moscow, also notes the sharp growth dynamics in sales. His company sells about 25 pieces of equipment per day, 70 percent of which, he calculates, goes to the provincial part of the country. “Both big cities and small towns order them. Sometimes they are sent out to villages where the mail service doesn’t even deliver,” Kozhekin says. In the villages, sellers have noticed a curious trend: When they send a piece of equipment to a rural area, they get a second order from the same area soon afterwards. Apparently, everyone wants to keep up with their neighbors. Many orders come from the southern regions, while most orders from the north come from Arkhangelsk. Kozhekin, however, does not explicitly connect the growth in sales to the rising price of vodka. “People want a better-quality vodka. Our customers are wealthy enough people who enjoy the process of preparing their own moonshine,” he says. Indeed, some moonshine enthusiasts pride themselves on their products. Not only do they buy or make all of their own sophisticated equipment, but they even order exclusive labels from print shops before they give the fruits of their labor to friends and relatives. “Reasons for buying vary, but, above all, people are tired of drinking poison,” says Ivan, a dealer from another shop that sells moonshine equipment. Sales are up 15 percent from last June, with customers spending an average of $300. “Rising minimum prices, excise taxes and counterfeiting will lead to an increase in the popularity of home brewing in Russia,” says Vadim Drobiz, founder of the Research Center on the Federal and Regional Alcohol Market. According to Drobiz, home brewing is currently popular among three demographics: low-income, creative professionals of modest means, and the well-off. In the past, low-income moonshiners would use illegal substitutes, but that has since become more dangerous. Wealthy buyers are interested, most of all, in being protected from sub-standard goods — whiskeys and cognacs are counterfeited with no less success than cheap vodka and wine. “They don’t care how much the alcohol costs. The demand for creativity, the desire to amaze one’s friends and concerns of fake goods are coming to the fore,” Drobiz says.